Providing affordable, high-quality dental services for the entire community. 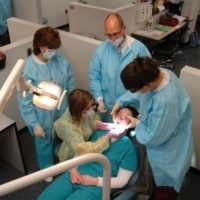 LCCC dental hygiene students and our highly qualified dental professionals are looking forward to providing you with educational, preventive and therapeutic dental hygiene services at a nominal fee. Because of the nature of a clinic in an educational setting such as ours, your treatment will progress at a slower pace than in a dental office. Patients can expect an appointment that is one to three hours long, and you may need to return for two to three appointments. Patients can be assured that the instructor/student interaction that requires more time during your appointment also means that your care meets the highest standards of quality. At the LCCC Dental Hygiene Clinic, we are happy to make this service available to all the residents of our community. This program benefits not only our patients, but our LCCC dental hygiene students and future dental hygiene professionals. Services performed at the LCCC Dental Hygiene Clinic are limited to preventive services, and are in no way intended to replace comprehensive dental care provided by your dentist. Appointments are required, and patients should expect to spend one to three hours per appointment. The clinic is open through the year, including summer. For current hours of operation or to make an appointment, call toll free, 800-995-5222, extension 4948, or direct-dial 440-366-4948. If it is necessary to cancel an appointment, please call 24 hours in advance of the scheduled appointment. The Dental Hygiene Clinic at Lorain County Community College is located on the first floor of the Health Sciences building (on the east side of campus, opposite from the Abbe Road side of the campus). Click here for driving directions and a campus map. Free parking is provided. Permits for reserved parking for handicapped and elderly patients may be obtained in the dental reception area. Receive complete, current and accurate information about his or her condition. Be informed in advance of the fee for service. Receive an explanation of recommended treatment, treatment alternatives, the option to refuse treatment, the risk of no treatment and the expected outcomes of various treatments. Informed consent prior to the initiation of treatment. Infection control measures mandated by OSHA.